Info "Man who catch fly with chopsticks..."
Flycatcher is a downloadable microgame in WarioWare: D.I.Y. and WarioWare: D.I.Y. Showcase. It was released on July 8, 2009 in Japan, June 7, 2010 in North America, and July 9, 2010 in Europe. 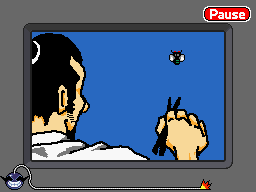 In the game there is a man with a pair of chopsticks looking at a fly which is moving around slowly. If anywhere but the fly is tapped, the man will move his hand very fast and a few special effects will appear on-screen until the fly is tapped. When it is tapped, a box will appear in front of the fly, with a close-up of the fly in the chopsticks and the word "GOTCHA!". If the fly is tapped, the game will be won. If the fly is not tapped, the game will be lost. This page was last edited on October 9, 2018, at 00:14.